The chance to get up close and personal with Big Nature, brings visitors from around the world: in the three days we stayed in town, we heard French, German, Russian, lots of Spanish, Norwegian (really? not in the WordPress spellchecker?!? ), Chinese, and a south Asian language we couldn’t identify (Vietnamese?). But the Japanese were first, and apparently came to stay. Three of the waitresses at our hotel were Japanese, as was the cashier at Safeway. And several shops lining the main street had “owned by Japanese” signs in the windows. And despite the deep wildness of the place, it IS possible to get face to face, or nearly so, with some of those big animals. 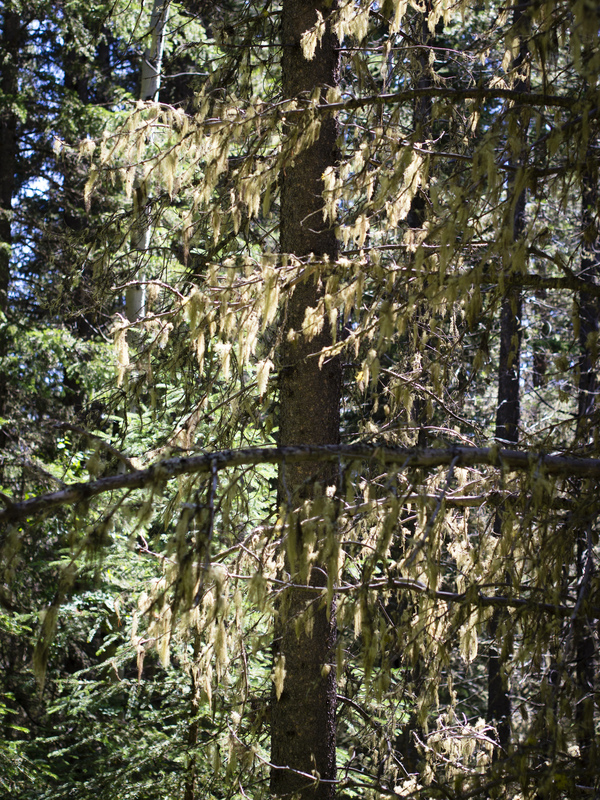 For our part, we only had two sightings this trip, both from the Icefields Parkway: a herd of elk along a treeline several hundred yards away, and a mother black bear and cub who dodged into the bush before we could get a camera ready. Others, apparently, have been having much more intense experiences. Back in June, a motorcyclist photographed a wolf chasing him along the Icefields Parkway (though I think he was actually in BC at the time); in July, weeks before our arrival, a cougar took to stalking tourists around Lake Louise – the trail was still posted with a cougar warning when we hiked it at the end of July. And this spring, Parks Canada officials are claiming the first verifiable pictures of Bigfoot, or was it a Sasquatch? I guess it’s the price you pay to maintain a natural ecosystem which is still readily accessible to visitors, aka invasive species such as tourists. There are, in fact, fences and — really rather quaint — wildlife crossings along this part of the Trans-Canada Highway. In town and out, garbage cans are bear-proofed. And sections of the park are closed whenever the rangers are concerned about animal activity, especially grizzlies, in an area. 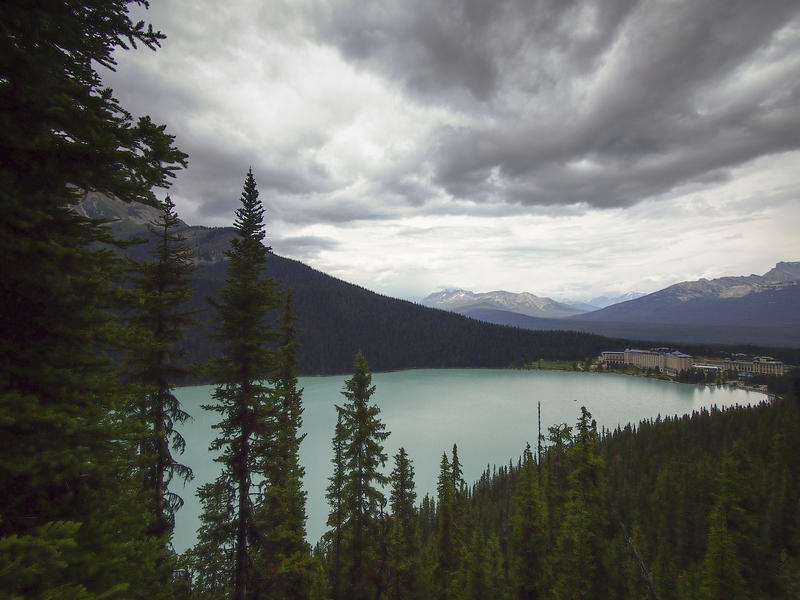 BTW, I have been updating my portfolio of pictures from the Banff trip for Getty Images on flickr. Check ’em out! As part of our regular summer trips to Canada, R. and I usually take time to visit someplace other than my old hometown of Toronto. Over the years, we’ve hit Montreal, Algonquin Provincial Park, and Vancouver. 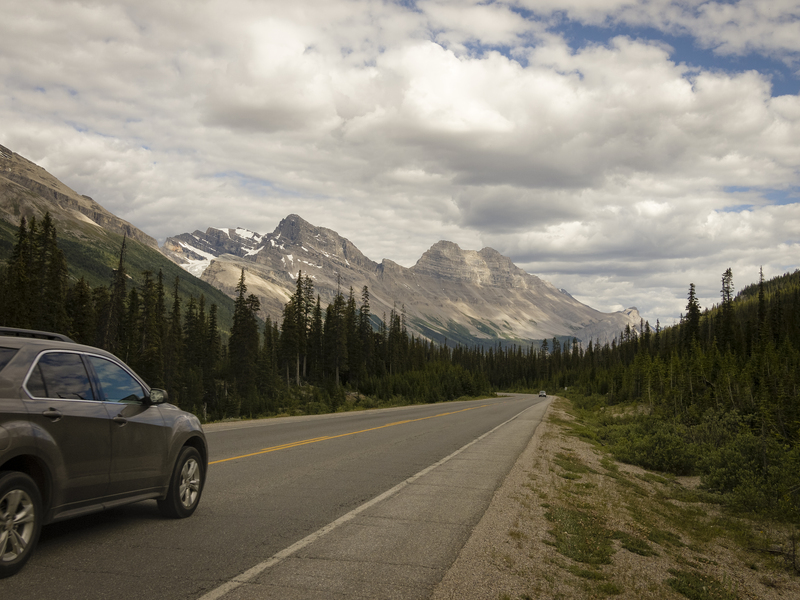 This summer, on our return trip back Tokyo, we stopped over in Alberta to spend a few days in Banff. 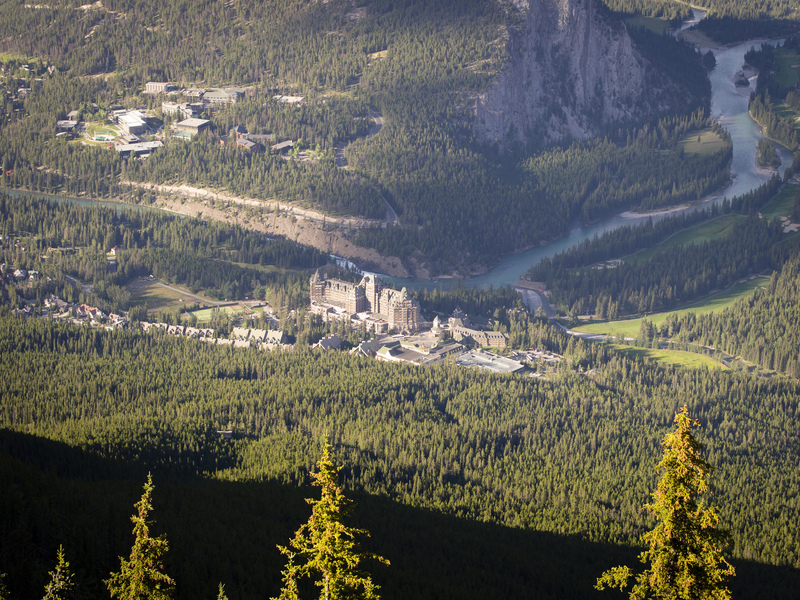 The town of Banff sits snug in the rain shadow of the eastern Rockies, an outpost of caramel apples, handmade soaps, and tiled hot springs in the wilderness. I use the word “snug” not just because that’s the same word used in the Banff Design Guidelines, but because even on the town’s main drag, Banff Street, houses, stores, and other buildings, even the Clock Tower and Cascade shopping malls, are built of materials and in styles which harmonize with the natural surroundings. In this way Banff reminds me of Wychwood Park in Toronto, a community inspired by the Arts and Crafts movement in England. William Morris and Frank Lloyd Wright would approve of Banff, though Wright’s picnic pavilion was apparently quite controversial (locals wanted a hockey rink). The one questionable exception to the Guidelines is also the town’s most notable building: the Fairmont Banff Springs Hotel. The American architect Bruce Price, who also designed landmark buildings for the Canadian Pacific Railway including Gare (Station) Windsor and Viger in Montreal, and the Chateau Frontenac in Quebec City, founded the Railway Gothic school of architecture – Canada’s first attempt at a distinctive architectural style – by looking back to Victorian Gothic Revival and French chateaux of the Loire Valley. I dunno. What works in old cities like Montreal and Quebec seems out of place to me in the mountains. Price apparently though his style organic; critics have called it “archaeological“. The medieval style would have worked wonders for my Dungeons & Dragons fuelled-imagination as a kid; even now I dig turrets and drawbridges in, like, the Lord of the Rings movies. But out here in the wilderness, I agree with the writers of the Guidelines in their specifications for a Rocky Mountain Style: especially when it comes to keeping things on a “human scale”. 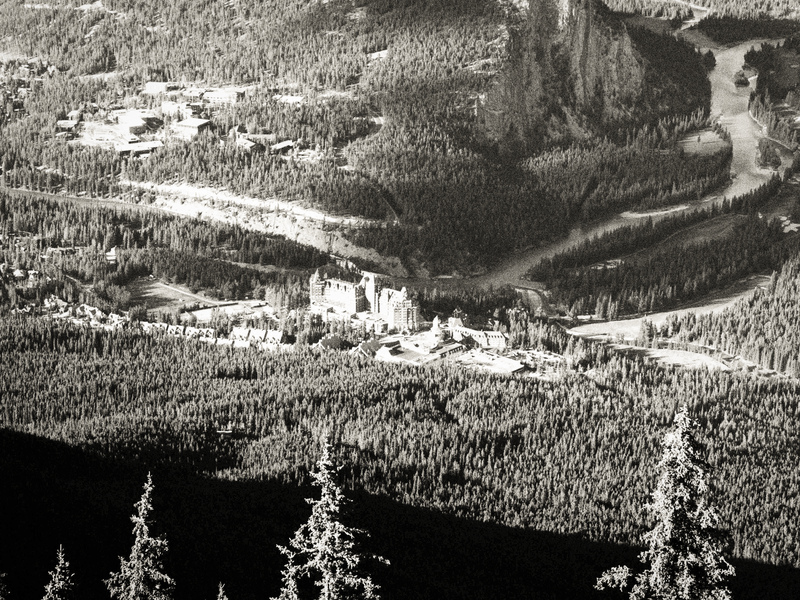 That said, the hotel does look good from a distance; from say, the top of Sulphur Mountain where this picture was taken. In over thirty years of camping and otherwise spending time out of doors, I can count on one hand the number of times I’ve seen an animal in the wild bigger than, say, the raccoons and porcupines which infest Frontenac Provincial Park. Index Finger: And this one’s set at a garbage dump, which stretches “in the wild” past credibility really. But I’m desperate. Dad and his girlfriend had rented a cottage for the summer near Huntsville, Ontario. One night we followed local tradition and drove out to the dump to watch the local black bears. Ten or so cars lined up, headlights reflecting on a small mountain of black and green plastic garbage bags while a trio of black bears made a mountain out of a molehill. One dude, a tourist, likely, same as us, had to get out of his car for a closer photo. One of the bears sped straight at him ’til the man locked himself back in his car. The bear, point made, returned immediately to eating. Clearly, this had not been an emotional event for him. Middle Finger: Once, on an early spring hiking trip in Frontenac, my buddy Tom and I came into a meadow where a fawn was drinking water from a puddle. The fawn, surprised, bolted in one direction. And from an explosion in the undergrowth nearby, whatever had been stalking that fawn – a wolf, perhaps – took off in the other, leaving Tom and I to wonder at just what goes on in nature when no-one’s looking. Ring Finger: One morning on a canoeing trip in Algonquin Provincial Park, Derek and I followed a great blue heron as it kept one bend ahead of us along a river that snaked its way through mile after mile of tall grass. We came around a bend to discover a moose cow standing ankle deep in the water. She watched us warily as she continued to eat, and our awe turned to consternation as we realized that she had no intention of moving for us, which meant we would have to paddle our suddenly vulnerable-seeming canoe within range of her hoofs on this narrow river. Of course, we made it safely past. Pinkie: Again not exactly a wildlife story, but once again with Derek, while still hallucinating from the jet lag of a flight from Seoul, Korea to San Francisco, we through our sleeping bags down next to the car in a national forest and tried to sleep as cowbells circled our impromptu camp in the dark, mist-filled forest. 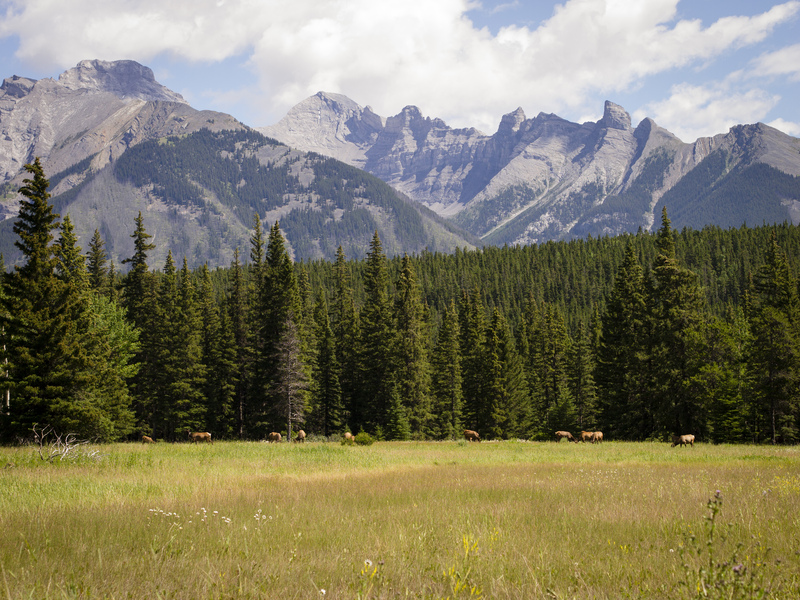 Thumb: This summer, heck just last week, while driving on the Icefields Parkway in Banff National Park, my wife Rumi and I spotted first, a herd of elk eating along a distant treeline, and second, a mother black bear and cub before they disappeared into the roadside bush. And oh yeah: a chamois on a grassy meadow in Murren, Switzerland, apparently startled that anyone would venture outside in a snowfall. in July. But you get the idea. Despite years of camping, hiking, canoeing, kayaking, and otherwise spending time out of doors, I have had very few large game encounters. The ROM is hosting the North American premiere of landscape and nature photographer Sebastio Selgado’s exhibition, “GENESIS.” Get more on Selgado and “Genesis” on this ROM web page, which includes inmages from the show and videos of Selgado. I used to live in this city; I’ve been a visitor for the last 18 years. I still think of it as my second home, though on a bad day I can feel like neither a citizen of Canada nor Japan. Things have changed since I’ve been away. The last time I visited, in the summer of 2011, my dominant impression was of the maturing city. When I grew up, living mostly in the Italian-and Portuguese dominated working class neighbourhood around Dufferin and Dupont, Toronto was still coming to terms with its multicultural identity. During my visit two years ago, I was impressed by the degree to which Toronto had matured: lots of mixed couples on the street; people everywhere, it seemed, studying Japanese or Korean. Only once, in a wealthy suburb, did my Japanese wife point out that she was the only non-white in sight and felt out of place – or at least conspicuous. First, Toronto is changing again, and it is once again experiencing growing pains. One-on-one, people still seem friendly and polite. In mixed company, however, in public, there’s a new tone of aggressiveness and even the potential for violence which strikes me as the worst of the best American cities like Chicago and New York. People rush streetcars and subway cars; strangers abuse each other until someone interferes; the gap between rich and poor – which was always there – seems to be growing, and with it an increasing insensitivity to the plight of others. “Coffee shop entrepreneurs” arrange spam-mail campaigns from their camp on the most comfortable seats in their local Starbucks. Second, and I think this connects to the first, despite all the condos being built it feels like the “Canadian Dream,” a kinder, gentler version of the American Dream, is taking more and more of peoples’ time and effort in what might be a kind of Bubble Economy. In other words, everyone is hustling to be a Have and not a Have Not, which seems chiefly measured by whether one has one of those aforementioned condos. As already mentioned, this trip I stayed in Cabbagetown, a neighbourhood just east of the downtown core and a part of the city that I never knew growing up (though my old high school at the corner of jarvis and Wellesley was arguably on its outskirts). Being here I felt not so much like I was in the Toronto that I know and love(d) but some smaller city or maybe town next door: kind of the way I felt when we stayed in Chelsea the last time we were in NYC. 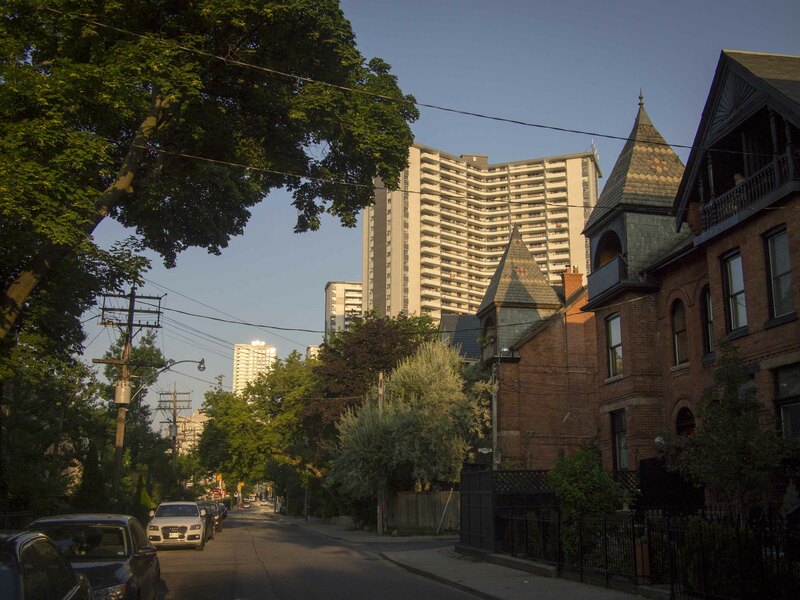 Cabbagetown itself is a pleasant neighbourhood of renovated Victorian houses and cottages sandwiched between St James’ Town to the north and Regents’ Park to the south: two of the highest population density neighbourhoods in Canada, and two of the poorest neighbourhoods in T.O.. So this is a part of the city where the winners and losers of the city’s growing prosperity, the 1% live next door to the 10% (note that I’m using these percentages figuratively). And, in between these two extremes are the so-called hipsters who seem drawn to this edgy bohemian/middle class enclave. As I say, a part of the city I might well have lived in had I returned to Toronto after Montreal (though the Annex is still my favourite part of the city). BTW, it seems that every lane and alley in T.O. 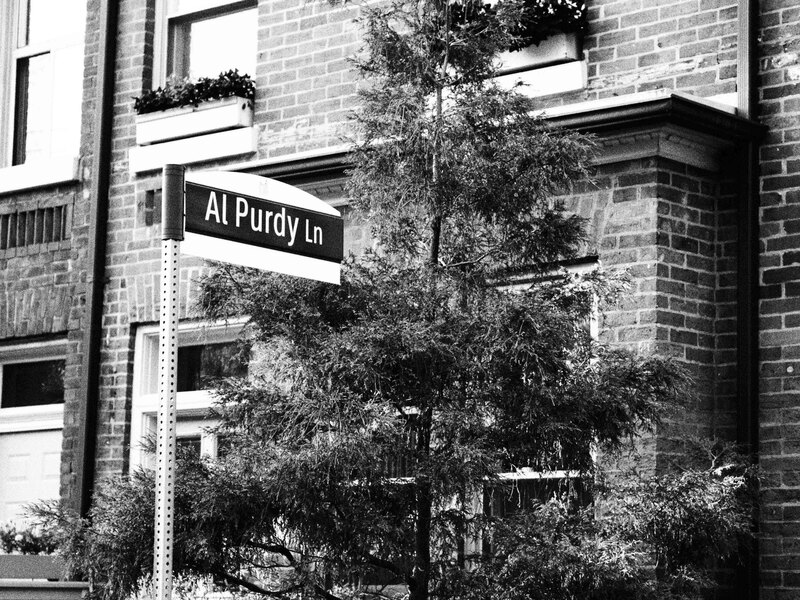 has been named for a Torontonian of greater or lesser fame; in Cabbagetown I was happiky surprised to find Al Purdy Lane, dedicated to Canada’s “unofficial poet laureate” and personal friend to both me and my father.